For the past month I’ve been thinking about the coziness of a writing shed. 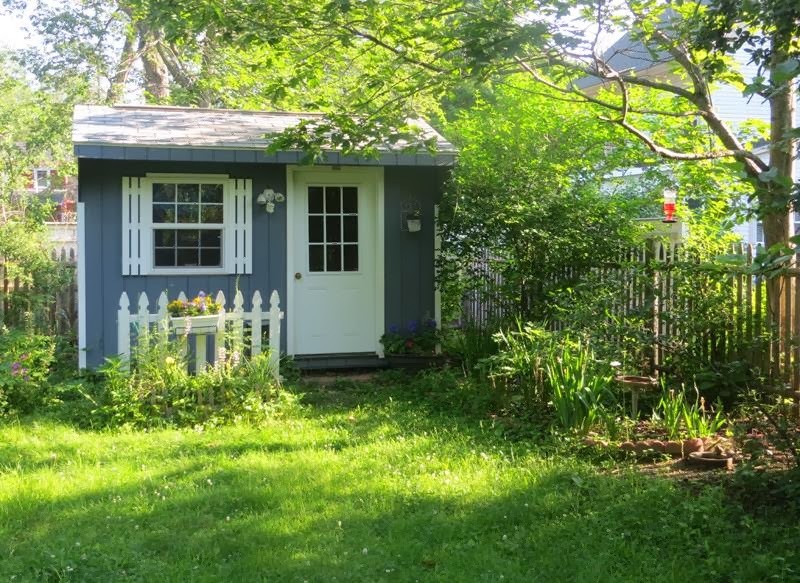 You know, that snug little house built for one — a hermit hole of creativity — that lies a few steps away from a writer’s actual house. Sounds divine, doesn’t it? Though I’ve only seen it in photos, one of my very favorite writing sheds belongs to Cynthia Lord, author of the Newbery Honor book, Rules, as well as Touch Blue, the Hot Rod Hamster books, and the forthcoming Half a Chance. Isn’t it sweet and inviting? Here it is on a snowy day. And here you see the lovely wood-panelled interior. 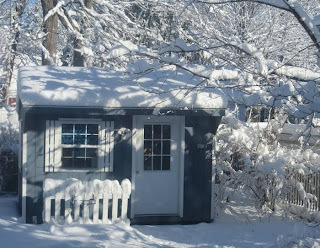 Cynthia told me the shed has electricity and she uses a space heater in cooler weather — that way she is able to use it full time for 10 months out of the year. She also said that it was relatively affordable to construct. 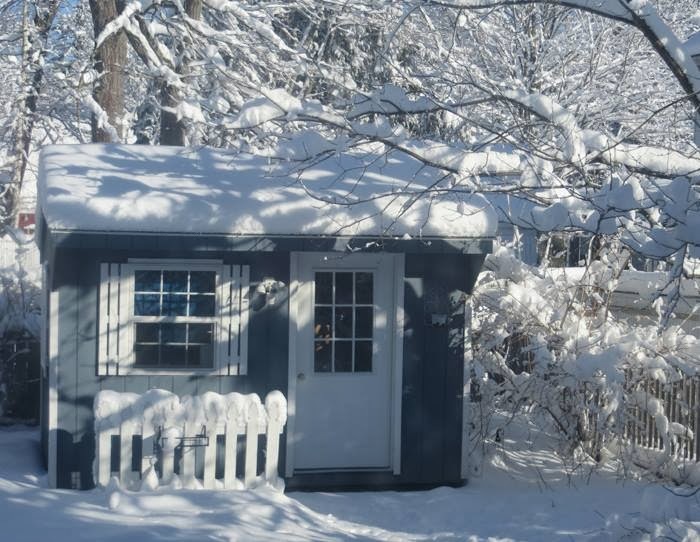 She purchased it from Hill View Mini Barns in Maine, having designed it herself using one of their customizable templates. Having it not attached to my house makes a nice difference, both for me and for my family. I’m not “home” in the same way that I’d be in a room of my house. So there’s a nice separation that feels like going to work. My family treats it differently, too. It’s not as easy to just “ask a quick question” so they wait. Even those little questions can pull you out of work. Plus I can pace the floor or play music or read things out loud without ever wondering if I’m bothering anyone. Thank you, Cindy, for the details and photos! Since we don’t have children, and my husband has his own office at the law school, I am pretty content with my home office. (Although the cat can be rather clingy, which often leads to limbs going to sleep under his weight.) 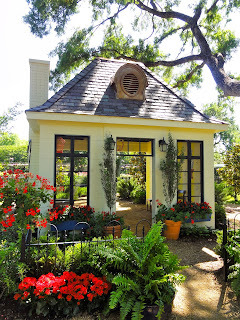 I do still fantasize about writing sheds, however. What would mine look like? 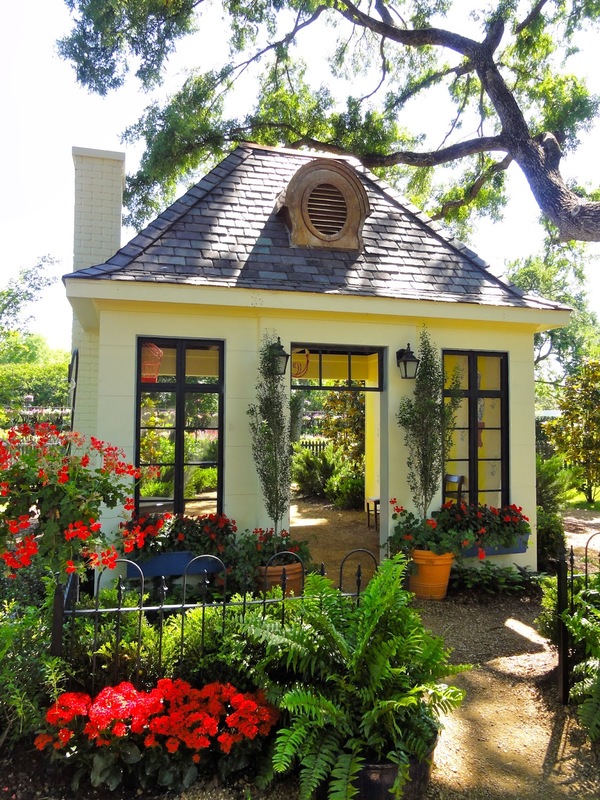 What would your fantasy writing shed look like? And how would you furnish it? This entry was posted in Writing and tagged writing, writing spaces on February 12, 2014 by SoniaG. 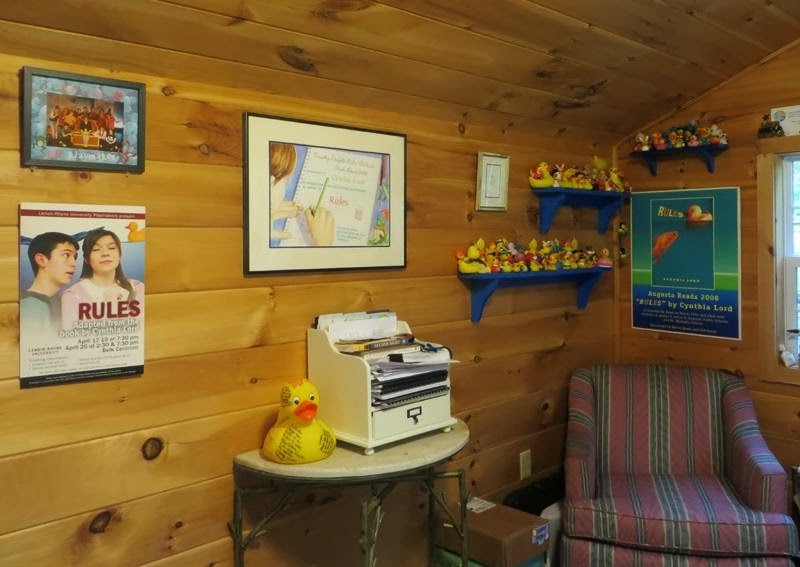 Occasionally I come across a photo of an author’s writing space and find myself overcome with delight and envy. Usually I just sigh at the hopelessness of ever having such a magical space, but from now on I will share these photos, maybe once a month, so that we can all study them for clues on how to make our own writing nooks more inviting and inspiring. First up, we have Vita Sackville-West (1892-1962), who seems most notorious for having been Virginia Woolf’s lover, but she also was a celebrated poet, novelist, biographer, and expert gardener. 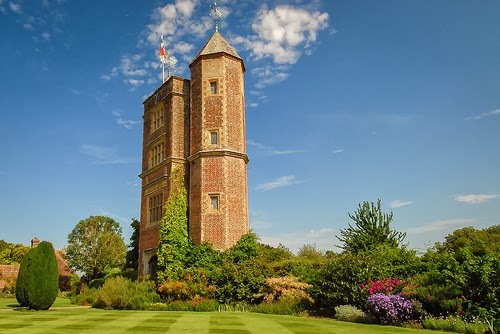 In the 1930s she and her husband Harold Nicolson purchased Sissinghurst Castle in Kent with the plan of restoring the gardens. Vita claimed the Elizabethan Tower as her own personal space. Can you even imagine? Actually, for all the allure of Internet-free solitude in a tower worthy of Rapunzel, it’s not hard to imagine the cold and damp creeping in. But I’m sure Vita had a servant build a fire, making it all toasty before she even stepped through the door. She wrote in the small room (small?) at the top of the tower so that she could have views of the garden she’d personally brought back to life. Apparently this was her “sanctuary,” and she rarely allowed others inside. I find this room so very appealing–it manages to look elegant and comfortable at the same time. 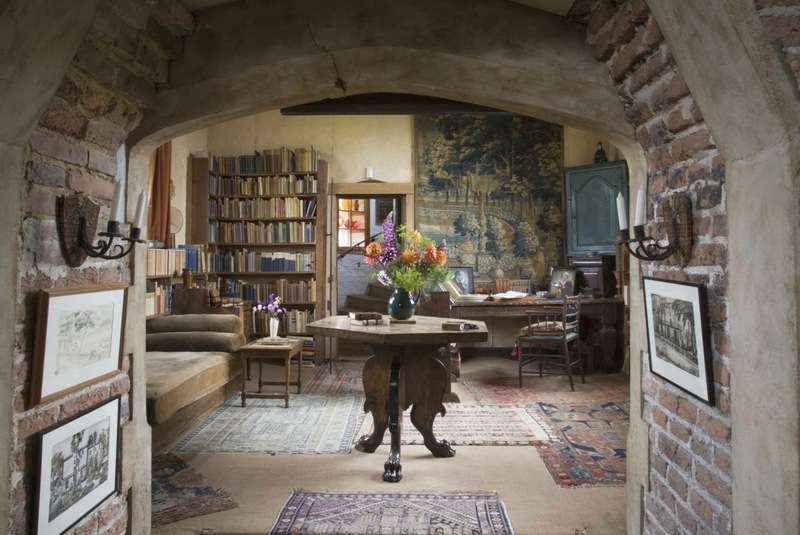 I could never replicate this look in my own office, but I have noted the rugs and flowers. I have a nice wood floor, but no rug. This must be corrected as soon as possible! And wouldn’t it be nice to have fresh flowers on my desk from time to time? (A nice silk arrangement would be more practical, but would it be as satisfying?) And though I don’t have much wall space, I could hang more pictures. 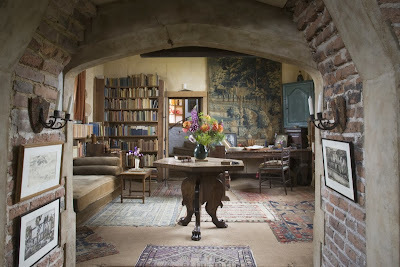 I’ve never read anything by Vita Sackville-West, but her writing space has inspired me. As soon as it arrives in the mail, I will dive into All Passion Spent. Perhaps it will prompt a “Tea and a Book” post? Stay tuned to find out . . . This entry was posted in Writing and tagged writing spaces on January 9, 2014 by SoniaG.